More on our Steam page! How often does an exchange on a game’s forum evolve, not only in a sincere friendship, but also in a fully developed, commercialized game? 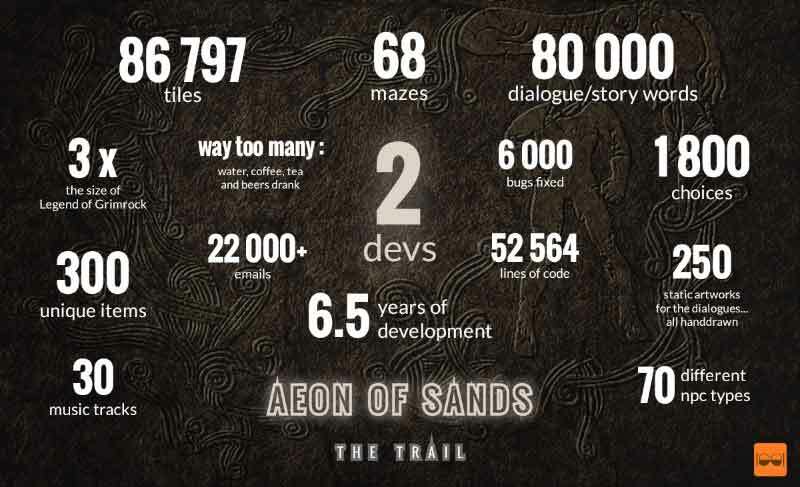 Yet, that’s the real lore behind the game Aeon of Sands, the first released game from Two Bits Kid. Florian, a software developer living in Germany, and Marco, an illustrator and artist from Italy, meeting each other on the Legend of Grimrock’s website. One was working on a 2.5d engine, the other on a user interface and character portraits, and both shared the same passion: retro, first-person perspective crawlers, think Eye of the Beholder and Perihelion. A recipe made in a dungeon crawler’s heaven, I told you! Now all good things take time : it took our two-men’s crew 6.5 years of their life to make Aeon of Sands, a game that’s not only a love letter to the crawlers of yore, but a unique potluck of many inspirations, from The Hitchhiker’s Guide to the Galaxy to the post-apocalypse genre, with some Lawrence of Arabia’s zest thrown in. A snippet of what are like the themes and the choices the player will face in Aeon of Sands.